This past weekend my sister and I headed to “out to the country” to visit relatives who just built a house in Gordon, Texas. 99% of you have probably NEVER heard or Gordon, and there’s a good reason why. 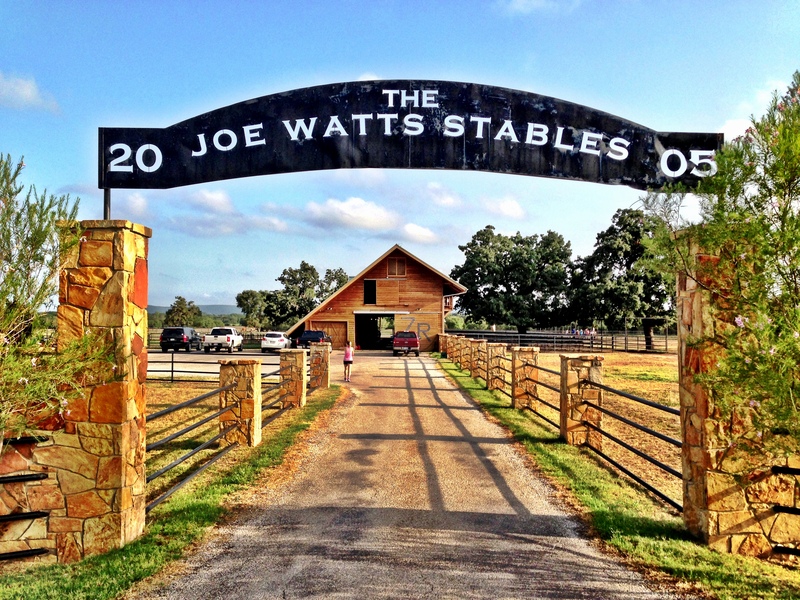 The little town is about 30 minutes west of Weatherford off I-20, and is the epitome of Texas country. It has everything you’d ever image from a small Texas town including windy dirt roads and rolling hills, a 6-man football team, cows, cowboy boots, cowboy hats, horses, and stables. It’s peaceful and perfect. Almost like what you would expect from the movies. 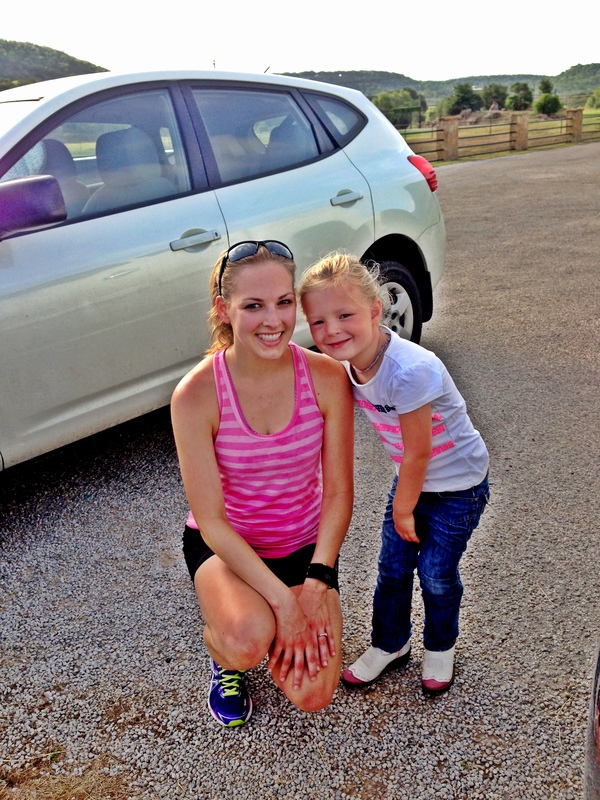 Brittany and I went running and stopped for a picture at the top of the hill. 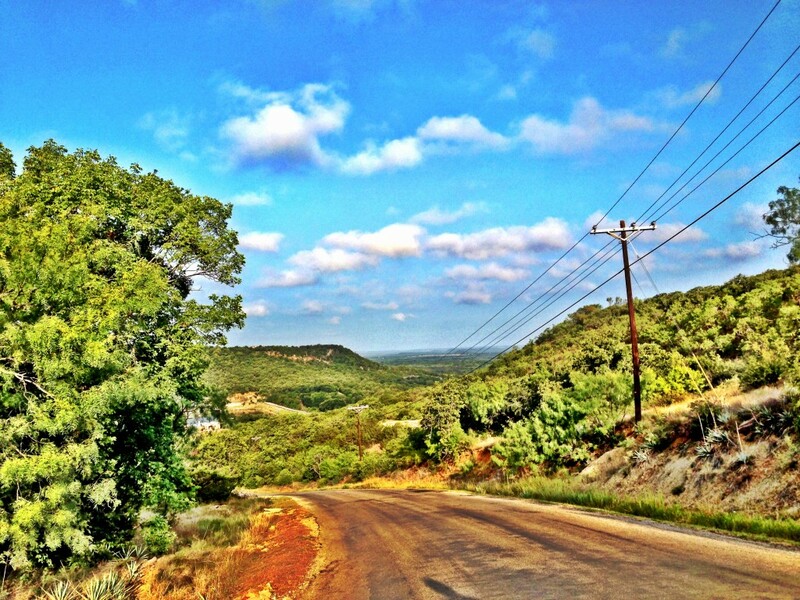 It doesn’t look like a big hill, but trust us, it was!! 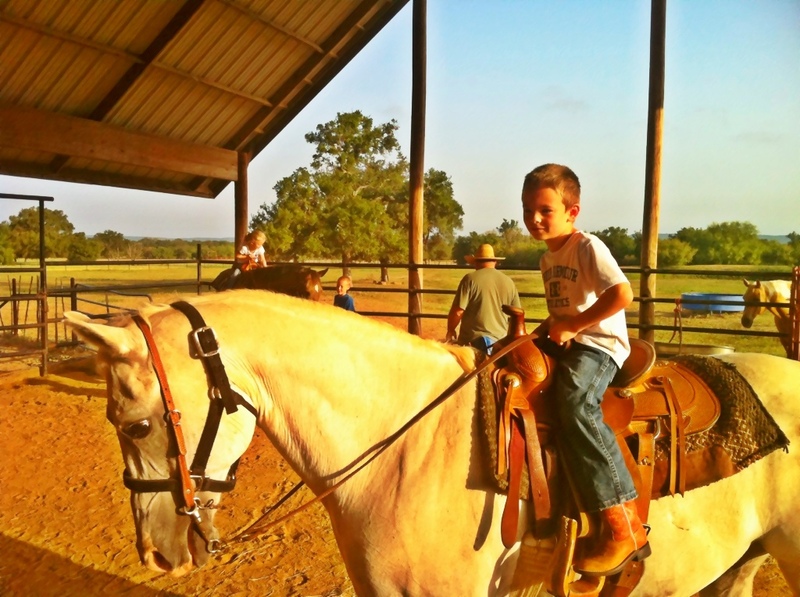 Horseback riding at the stables. Our cousins had a blast on their horses. We had breakfast at a little cafe. 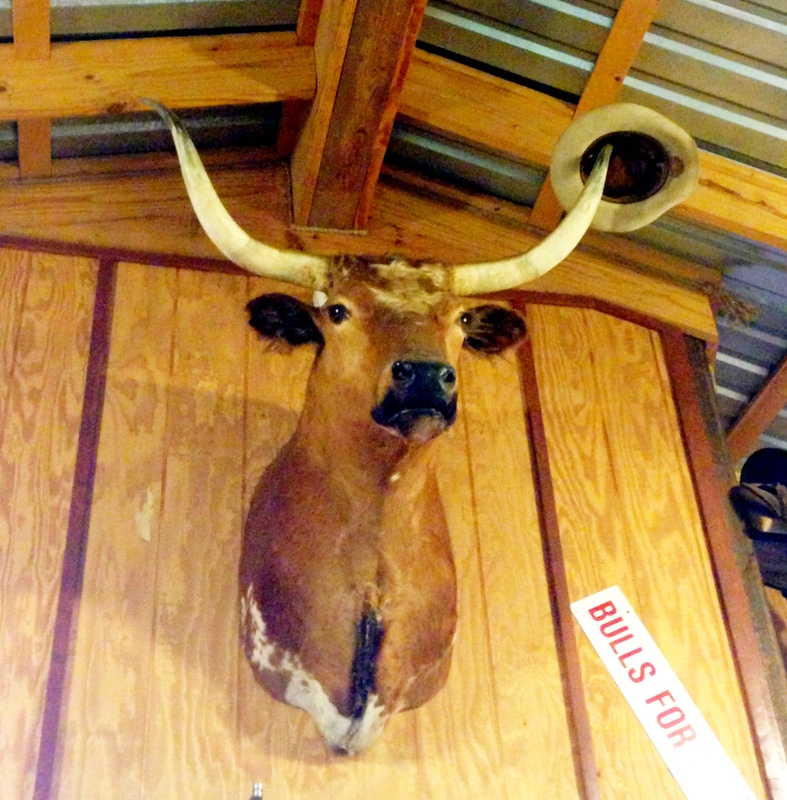 The pancakes were as big as the plate and this cow was staring at us the whole time! We went to a farmers market in downtown Gordon and picked up some fresh eggs, honey and homemade whole wheat loaf bread. Then our cousins played in a nearby park. 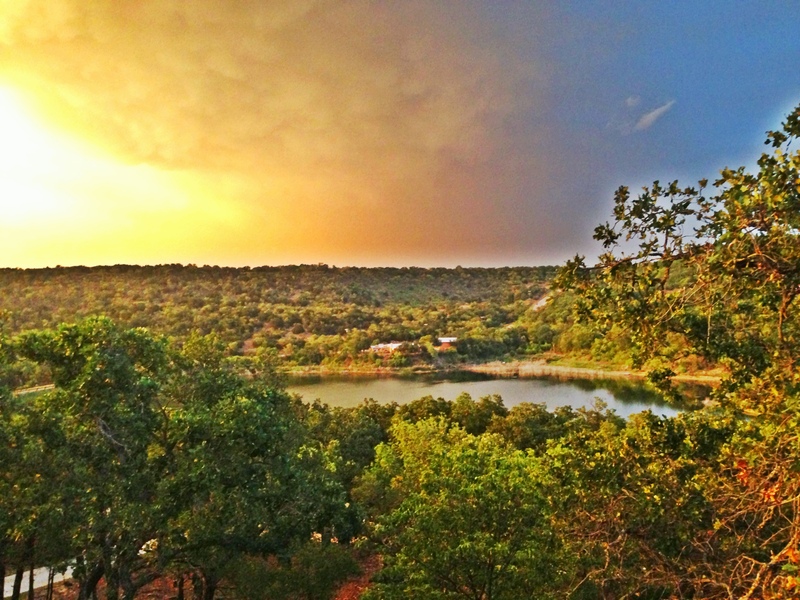 The gorgeous view and sunset from my aunt and uncle’s porch in Gordon, Texas. 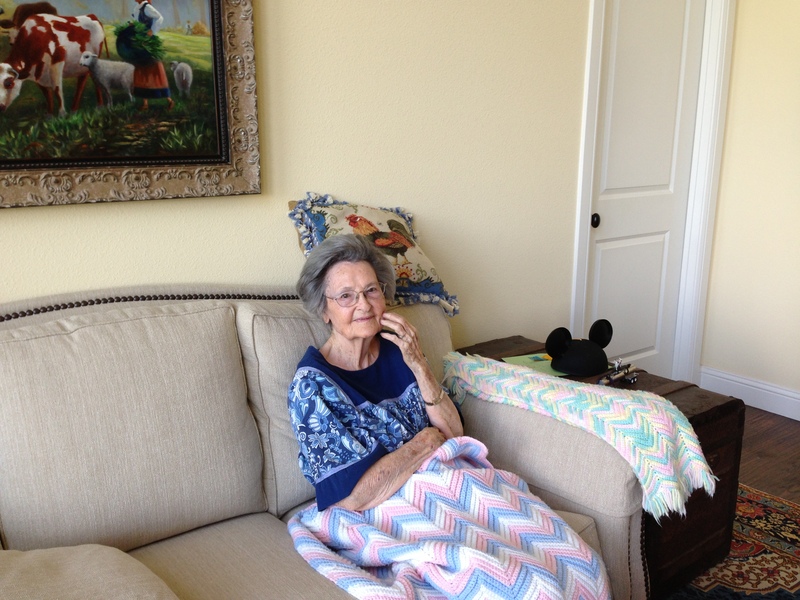 We also got to visit with my great aunt Nanny. She’s 91 years old and still LOVES sweets, especially chocolate thus we brought her my Mom’s secret ingredient brownies. Nanny’s older sister was Nila, my grandmother. Recently my mom, sister and I had been going through Nila’s old green recipe box and tabbing the ones we wanted to make. One of those recipes were these easy no-bake skillet cookies. 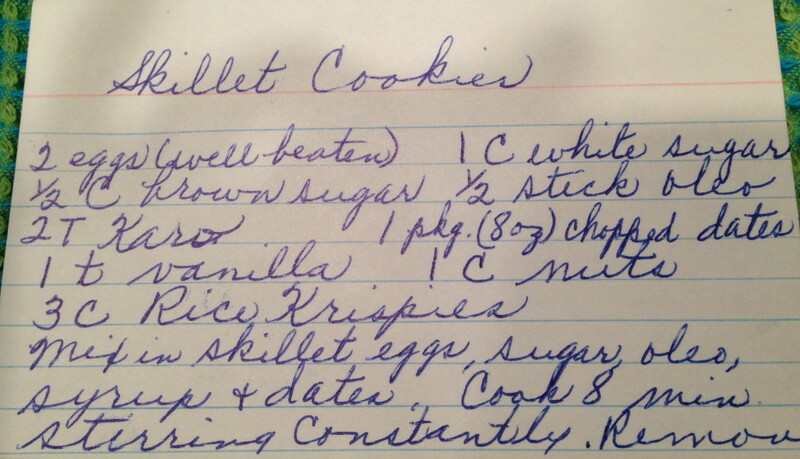 Nila’s handwritten recipe for Skillet Cookies. All our relatives at Gordon LOVED the skillet cookies and thus we kept going back for seconds and thirds. No one, including us had ever heard of a cookie like this, and while the ingredient list (dates, pecans, coconut, sugar, butter and eggs) doesn’t sound too appetizing, the cookies are surprisingly good! Not only are the skillet cookies pretty (I think they look like little truffles rolled in finely shredded coconut), they take less than 30 minutes to make. Sometimes old-timey recipes are the best ones; case in point: these skillet cookies. Now we’ll just have to see what other recipes Nila has in that old green box of hers!! 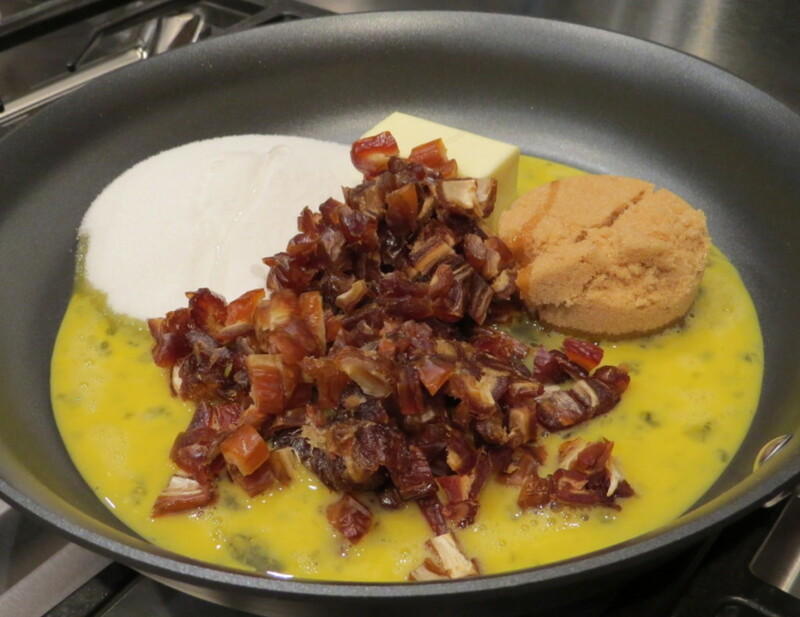 Combine butter, sugars, karo, and dates in a large skillet. Cook on medium-low for 8-10 minutes, stirring constantly. Remove from heat, add vanilla, nuts and Rice Krispies and mix well. 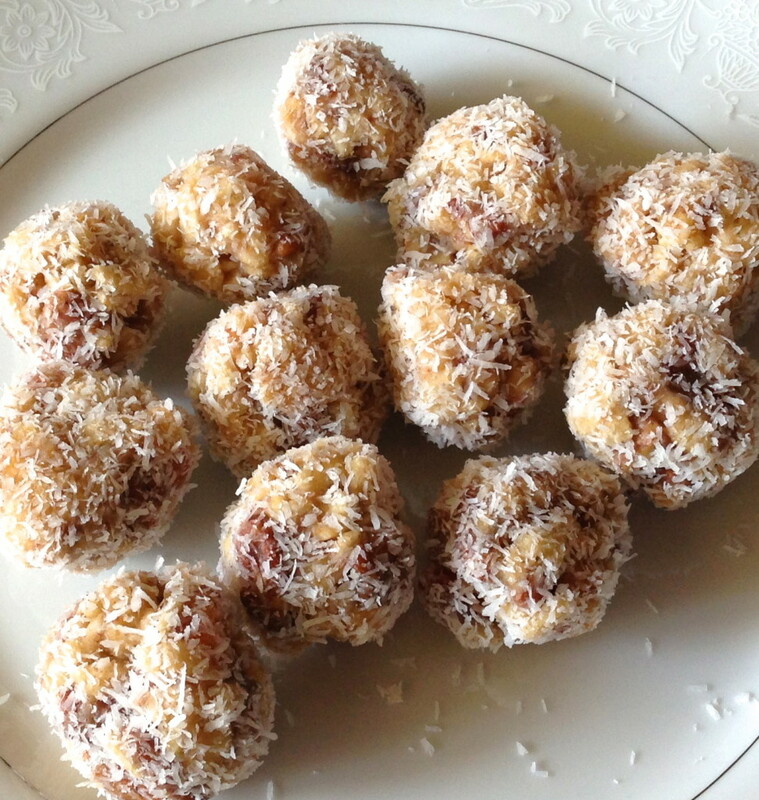 Pinch dough into balls and roll in shredded unsweetened coconut. 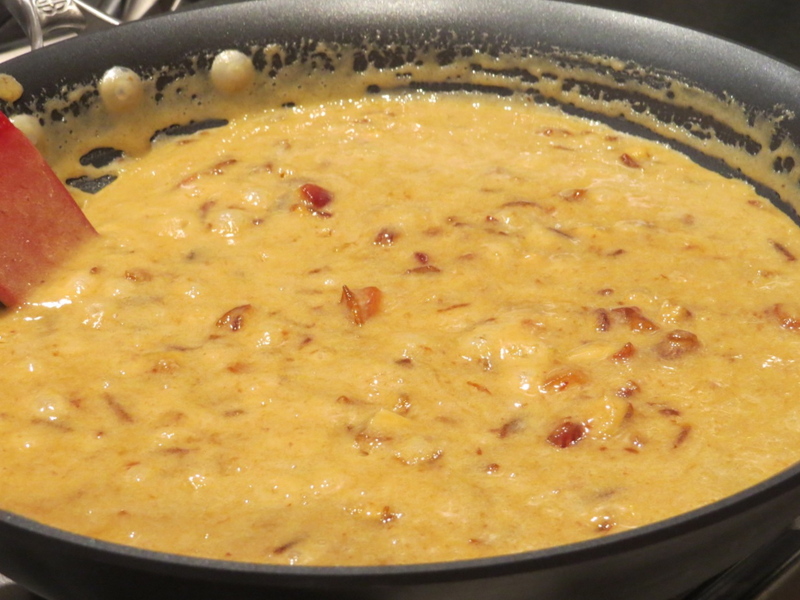 Combine eggs, sugar, butter, Karo and dates in a large skillet. Cook for 8-10 minutes on medium-low, stirring constantly. We saw tiny little bubbles start to form, but we did not bring to a full boil. Remove from fire/heat and add vanilla, nuts and Rice Krispies. Mix well and let cool slightly. Butter your fingers (butter works better than cooking spray), and pinch dough into balls. 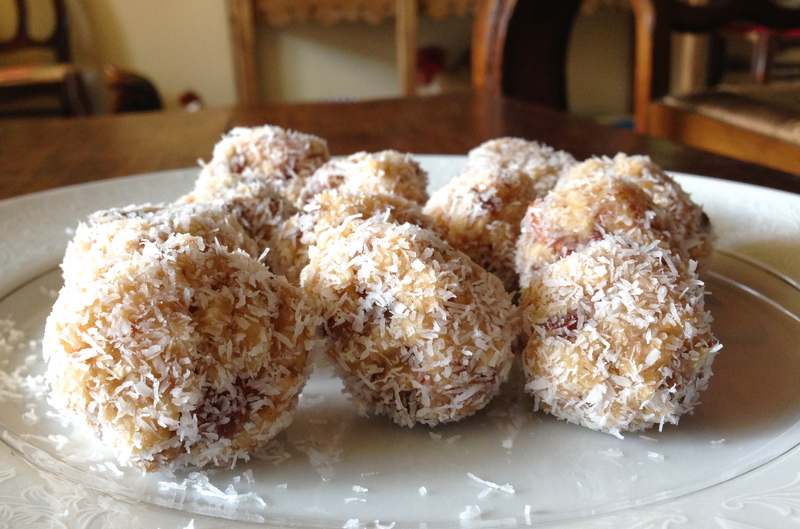 Roll the balls in the coconut. 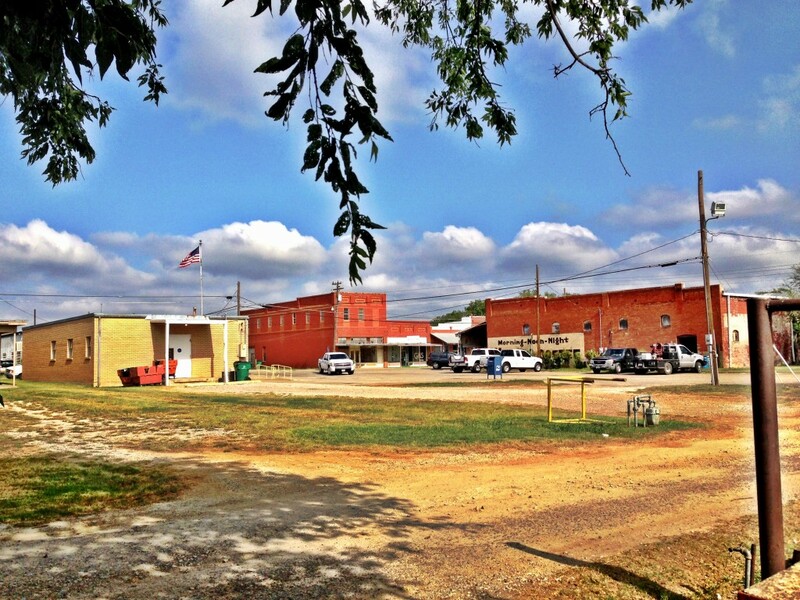 4 Responses to "Gordon, Texas and Nila’s Skillet Cookies"
I loved the story. I’m very sentimental, so having your grandmothers recipes is very special. How lucky you are to have them. 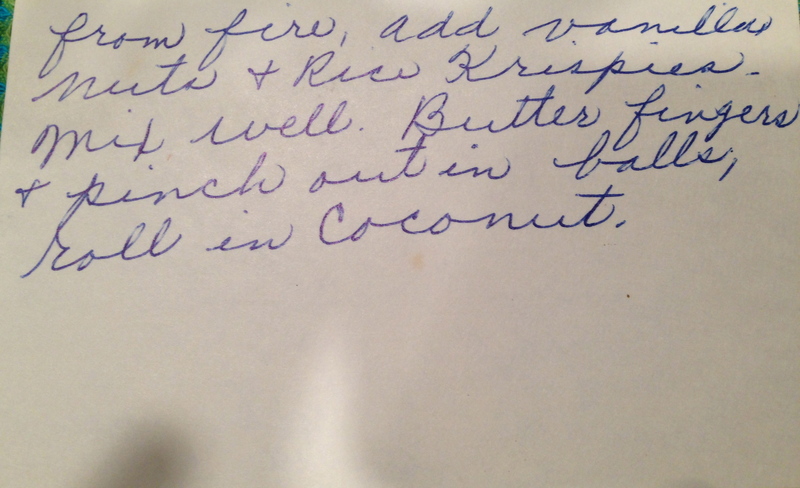 I wish I had kept some of my grandmothers recipes in her own handwriting. I’m also proud I got to taste them. I’m not a date fan, but these were good. Awww thanks! Now you just need to come visit Jan in Gordon!